With an arm full of historic photos and paintings, a guide will take you on an easy walking tour through Melbourne’s parks, along Crane Creek and through the older section of town discussing Melbourne history, native versus invasive vegetation and Crane Creek wildlife. Petals Flower & Gift Shoppe, Inc. This full-service florist sells arrangements for varied occasions, plus gift baskets & silk flowers. 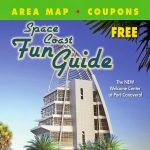 The Sky’s the limit for a vacation of fun and relaxation when you let the Space Coast Fun Guide direct you to the perfect accommodation, fun things to do, where the best eateries are, and best of all how to get there by using our easy to read map. “Main Street” shopping concept featuring over 80 stores including premier national retailers, select local merchants, and specialty restaurants in an attractive setting. Enjoy the beautiful weather and great shopping year round at The Avenue.